I set off West towards the stone beach, and off on the beginning of my arduous journey. It would take maybe two days to get there, and another two back, but I was willing to do anything to take revenge on HoN Co.! I had got to know the area around me quite well in the past few weeks, and I had got to the point where I knew where I was going based on the compass and landmarks alone! I had established a series of mental checkpoints in my head, which allowed me to judge whether I was progressing ahead or behind schedule. 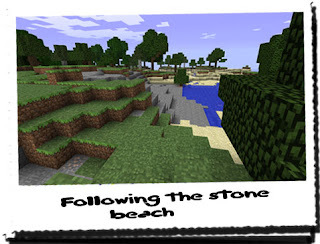 The stone beach was the first, followed by the large cliffs I would have to pass where I would have to travel North. Then the large waterfall to the West would be the point where I continue travelling West again, following the coastline. From there, the next checkpoint was the crossing point to a landmass further to the North East. I continued West until I saw the familiar grey stone exposed next to the water's edge. The stone beach! I was making excellent time! The seething hatred for HoN Co. was only just held at bay by the thought of their faces when learning about the destruction of two more of their precious portals! After that, I would work with THEROS, hopefully as a member of L7 to destroy the remaining portals, and bring down HoN Co.! I tried to distract myself with the scenery; with the path I had chosen practically skimming the edge of the coast the entire way, it made for stunning views, and soothing ambient sounds. The sound of rushing water alone was enough to wash away my anger, but I still felt the same inside; HoN Co. were going down! After about two hours, I had reached the small forest area to the East of the large cliffs. It had taken a little longer than expected; maybe I had taken in too much of the surroundings! Setting my mind into the right frame, I continued on from the far South side of the cliff, it lying parallel to my path all the way North. It had only been a few weeks since I was up there scanning the surroundings, trying to find Jonas' house! A LOT had happened since then, most of which I regretted or didn't want to think about. I had lost my home and practically become a fugitive, living in secret, away from the guards of the so called "company" I worked for! A lot was messed up with life, but there was no changing the past... Merely attempting to foresee the future! After another two hours, I had made it to the far Northern end of the cliff, and had emerged beside the huge waterfall I had found the first time I had come this way! It was beautiful how all of the water that had pooled around below and ran into the sea had come gushing from a small hole up near the top of the cliff! Trying not to get too distracted, I continued at a slant, heading more or less North West as though I were going towards the island with the portal. This took me past the large pool I had passed before many times, but also around an area I hadn't been around in a long time. Not wanting to get lost, I literally stayed within a few metres distance from the edge of the water, ensuring I followed the curve of the land to take me to where I wanted to go. As a result, I could easily go across to the other landmass by crossing the thing little divide without ever having to consult the map! That is if I didn't become distracted or come under attack and lose my position! I thought this to be very unlikely, and staying on the edge ensured that any landmarks I could see were easily identified if I needed to consult the map. As I made my way in this direction, I noticed a few small islands in the middle of the sea, which, after taking out my map, I noticed that they correlated with the detail! Whoever drew this map did so with a great degree of accuracy. It had served me very well, but the only problem was it was a bit small. Sometimes it lacked detail when I needed it. Putting the map back after confirming the location, I continued in the North Westerly direction for about three hours. I wanted to see if I could get through the entire walk without needing to stop... It was going to be a challenge, but it meant less walking for tomorrow! I was about a third of the way when I decided to have a snack. I had reached the end of the trek towards the North West, and had resumed the Northern route for a while. It was going to be a straight run North from now on until I needed to cross to the other landmass. It had already passed midday, and I was very happy with my current progress. I continued walking as I snacked on bread and milk. I had attempted to cool the milk by keeping it in the bottles submerged in water overnight, but it had warmed up again whilst in the bag. However the milk still tasted fresh, and was very sweet. The bread gave me the energy to continue without needing to stop, and the ten minutes or so it took me to eat and drink it took my mind from the arduous journey. After that, it was back to the letting my mind wander! The note that THEROS had sent me had answered the questions I asked, but as always, it had opened up new points of interest. Who were the other five members of L7? What did they do? Did they specialise in something? How did they always find me? Millions more, but they'll probably be answered in the coming days when hopefully I can join them. I had to remove all contact with the previous life I had, and live with them, working and fighting against HoN Co. ... To be honest I couldn't think of anything better! I had become lonely recently, and taking revenge was going to be ever so sweet! They may not have wronged me directly, but now I know they placed that cage near the portal to attract Creepers from it to kill me. I take that very personally! Another three hours and I had finished the journey travelling North. Up ahead, I could see the small crossing that was linked on the map. It was a small cluster of trees on both sides, linked together with a thin patch of sand extending the length of the gap. This would be very easy to cross, and it was unlikely anyone would see me. Except... I began to wonder if someone from the L7 was watching me now... I wouldn't know about it, and they could be tracking my every move! I suppose that would be the way to prove I had destroyed the portals. However, if they could track me... Could the guards, or the figure...? I cast it from my mind, trying to think about positive things. I began to think about the wealth of information I would be allowed to access if I was allowed to enter into the L7! From the way THEROS stated, it sounded as though they knew everything that needed to be known, and would most likely have equipment that I could only dream of making! I was happy with my compass, and the very basic piston-gate mechanism... Not that that mattered anymore... Chances are, I was never likely to see that place again! I had put so much time, effort and resources into that place... But even if I could go back, I would only feel like burning it down... It was tainted to me... It could never be the same again, and going back would only make me do something I would later regret. I would get to the location of a previous portal, travel through the tunnel, destroy the remaining portals in the temple and return to Jonas' house and wait for further instructions. From then on, I would have to forget about the life of Syeonyx... I would be someone else entirely! It's started to get dark, and I've made about a further two hours worth of progress since the small link between landmasses. I've more or less kept following the coast the entire time. However this puts pay to the idea of rowing back! There was no way to cross the beach link to get from one body of water to another! Unless I either dug out a small channel, or carried the boat over the gap! I would come to that hurdle as and when it is necessary. For the moment, I am settling down for the night. I have stopped a little early to give me ample time with natural light to put up the tent. Previous attempts haven't been particularly fast, but there was always a first time. I'm shacked up in my tent, and I'm just waiting for the tiring exercise to catch up on me to send me to sleep! I've walked practically non stop throughout the entire day, and yet I feel incredibly awake despite this! 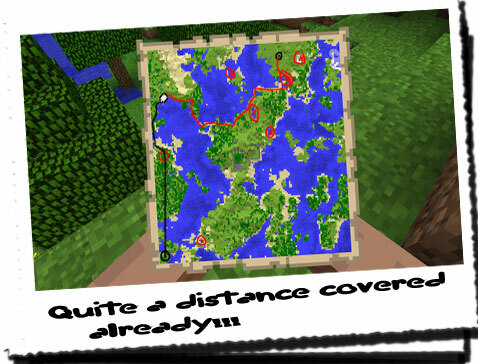 Looking back at the map, I estimated that I had travelled probably over halfway! The last bit was going to take a bit of time, and was considerably more boring than today. Last time it had taken about four hours to get through the long tunnel to the dirt hovel. However this time I would need to be more cautious about guards hanging around. They may have a feeling - or already know - that I'm heading back there to destroy the remaining portals, and HoN Co. may have placed guards to protect them! I would have to psyche myself up if I was going to have to kill someone, and if it was possible I would settle with injuring them. The death of a person would be too much for my consciousness, unless I knew it was the only option to me... I'm hoping that the L7 can teach me to respond better to violence, as I can see it being used heavily in the future! 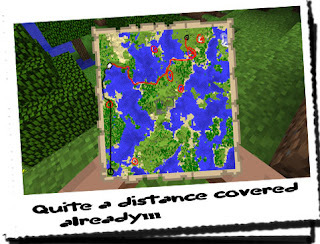 Looking again at the map, I also noticed a small gap between the landmass I was on now, and the one I needed to be on... This would mean going for a little swim if I wanted to stay on the map! I was hoping I could wade most of the way, but I am prepared to swim the distance. Tomorrow sounded like it was going to be considerably more eventful... and tiring! Especially if I was going to row back! I was going to need my sleep!